cyberTribe presents SOLID - an International screening of Indigenous Womens storytelling. Its FREE. Curated by Jenny Fraser, SOLID Screen includes a range of short film works and digital stories from Aboriginal Australia, Kayche Festival in Mexico and other Indigenous women Digital Storytellers in an expression of solidarity. Theres a Bundjalung Welcome To Country Ceremony at 10am at The Quad. 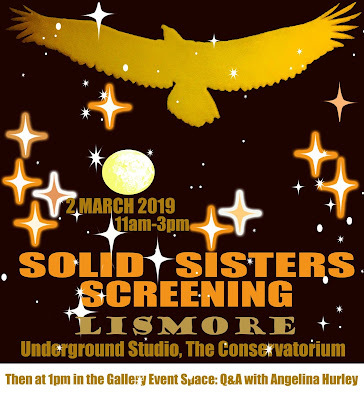 The SOLID Screening to be held in the Underground Studio of the Lismore Conservatorium looped from 11am - 3pm on Saturday the 2nd March 2019 will show works by and about women, and it is open to the public, for all. In the Lismore Gallery Event Space at 1.10pm there will be a Q&A with Angelina Hurley (of Wild Black Women, The Point NITV), who will discuss her film 'Aunty Maggie and the Womba Wagkun'. The 2019 Solid Screen event is also partly supported with a small grant through Screen Queensland.